Uncle John’s Fruit House Winery & Cider Mill from St. John’s, Michigan, earned a “3rd Place” in the Royal Bath & West Show in Shepton Mallet, Somerset, Engl and. This is the second consecutive year that Uncle John’s has been recognized at the event – noted as the world’s largest cider competition. The Royal Bath & West Show dates back to 1895, in what North American’s would call a pro-am format – with professionals and amateurs competing side-by-side. This year’s judging received a record 518 entries, up from 498 in 2 012. There were 16 different classes in the judging this year, with two of those dedicated solely to entries from outside the United Kingdom (and a total of 52 international entries). Uncle John’s was the only American cider honored in this year’s competition. 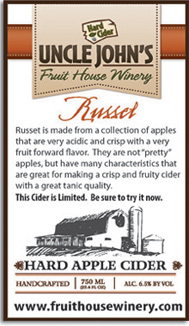 Russet Cider is a blend of many “russeted” apple varieties: Golden Russet, Roxbury Russet, Knobby Russet, Razor Russet and Hudson’s Golden Gem, to name a few. The cider is dry and sparkling, fruit forward with an earthy/mineral finish, and 6.5% ABV. It is available in limited distribution (bottle and draft) at Uncle John’s tasting room and a few selected locations around Michigan, Chicago and Portland, OR. Earlier this year, Uncle John’s Russet Cider received a silver medal in the “Old World” category at the 2013 Great Lakes Cider & Perry International Competition. For more information on Uncle John’s Russet Cider and the Uncle John’s Fruit House Winery & Cider Mill, please visit UJCiderMill.com or FruitHouseWinery.com. Uncle John’s winery and tasting room is housed in an 85-year-old restored fruit packaging house located at 8614 N. US 127, St. John’s, MI 48879. 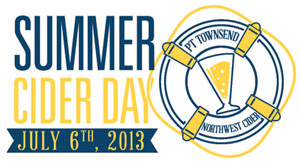 The Northwest Cider A ssociation’s 3rd Annual Summer Cider Day will showcase the diversity of Pacific Northwest craft hard ciders on July 6th at the Northwest Maritime Center in Port Townsend, WA. Summer Cider Day is the Northwest Cider Association’s (NWCA) biggest event of the year and has helped establish the Northwest as a nationally recognized cider region. Featuring 18 regional cidermakers from Washington, Oregon, Montana and British Columbia (Canada), Summer Cider Day offers over 60 different varieties of hard cider. The festival provides the experienced cider enthusiast or the newly cider-curious the opportunity to sample a complete range of styles and flavors. Ticket prices are $25 per person or $20 for NWCA members and may be purchased at BrownPaperTickets.com. Event ticket price includes admission, 10 tasting tickets and a keepsake NWCA glass. Ticket prices for those under 21 or for designated drivers are $5 at the door – these tickets do not include tasting tickets or the keepsake glass. Additional tasting tickets will be available for purchase, and there will be an on-premise cider shop. Hours for the festival are 12PM-5PM. A VIP tasting hour from 11AM-12PM is planned for NWCA members, sponsors and media. The NWCA is a trade organization formed by cider producers throughout the Pacific Northwest in order to promote awareness of regional artisanal ciders. All funds raised through the event will benefit the important work of the NWCA. For more information, please visit the Northwest Cider Association’s website NWCider.com or follow the organization on Facebook at Facebook.com/NWCider. Cider producers are not alone! With the cider industry on the rise, government support is being given to cideries and apple orchards across the United States. This is great news for cider producers since support is commonly seen in increased supply of land dedicated to apples, subsidized costs of apples needed to produce ciders, and easily navigable legislation to produce cider. In Virginia, the Department of Agriculture granted nine different orchards funds to produce apples specifically for the hard cider industry in amounts from $500 - $3,000. In order to be eligible for the grant, orchards had to plant trees that produce hard cider friendly apples including Arkansas Black, Black Twig, Kingston Black or Gold Rush apples. Maureen Kelly, Nelson County’s Director of Economic Development and Tourism, told the Nelson County Times that one of the original intents of the grant was to produce seven new acres of orchards that would be dedicated to cider production, but that goal has been already surpassed by over 400% with 31 acres of new land already committed by farmers involved in the program. Although the fruit from the new trees won’t be harvested for a few years, it means that the cider industry will have plenty of room to grow, and Virginia cider producers will be able to increase the amount of cider they are producing. Similar government funding has been seen in Canada. Dommaine Pinnacle Ice Cider, which now sells over a $1 million worth of cider every year got their start from a $300,000 government loan from the Capital Financiere Agricole (CFA). Charles Crawford, Founder and President, told the Center for Small Business Financing that a good business plan and loans from serious funders were important for starting Dommaine Pinnacle. 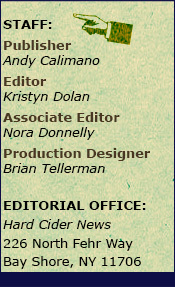 Further supporting the cider industry, Governor Andrew M. Cuomo of New York recently announced an agreement for two bills affecting the cider industry. The Farm Cideries Bill (Governor’s Program Bill #18) will establish a new license for farm cideries similar to the licenses already available to farm wineries, breweries, and distilleries. The Brand Label Registration Bill (Governor’s Program Bill #17), will streamline and modernize the brand label registration process for all alcoholic beverages and provide an exemption to the registration fee for craft manufacturers producing small-batch spirits and hard ciders. 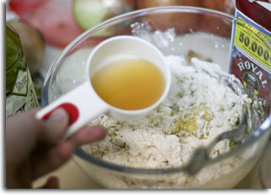 In order for a cider producer to obtain a farm cidery license, the hard cider must be made exclusively from apples grown in New York State and no more than 150,000 gallons may be produced annually. Farm cideries would be allowed to offer tastings of and sell not only cider, but also beer, wine and spirits made from New York products. By allowing farm cideries to expand the activities that can be conducted at the licensed premises, these businesses will become destination locations that will promote tourism within their communities. Additionally, the need for apples in the manufacture of New York State labeled cider would create a sustained demand for products from New York’s farmers. The Brand Label Registration Bill provides a business friendly exemption from brand labeling fees for ciders produced in small batches of 1,500 barrels or less. There are many states that are doing fantastic things to increase the growth of cider and provide the products needed to make cider. This clearly demonstrates the demand of cider and the ability of the cider industry to continually prosper. 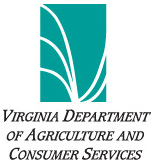 For more information on the Virginia grants, please visit Virginia Department of Agriculture and Consumer Services online. 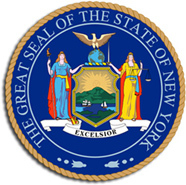 For more information on the recent New York legislation, please visit the New York Governor’s Press Office online. 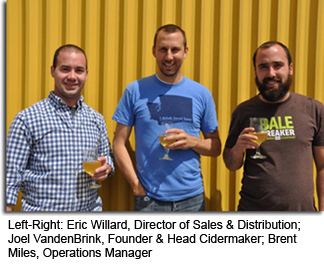 Earlier this month, 2 Towns Ciderhouse introduced the newest addition to its line of flagship ciders – The Brightcider. The Brightcider is made with a new blend of high quality fresh-pressed Northwest apples that have an even juicer aroma and taste profile, creating a cider that is super fresh, aromatic and bright with a sessionable 6% ABV. The Brightcider will replace The Incider as the 2 Towns flagship semi-sweet cider. True to 2 Towns style, The Brightcider uses all Northwest ingredients and is fermented to perfection at cool temperatures. The new blend of Yakima and Hood River apples includes Jonagold, Honeycrisp, Granny Smith and Rome Beauty apples, among others. Brightcider is available to bars and restaurants in ½ barrel kegs, 1/6 barrel kegs and 500 mL bottles. In addition, Brightcider will be available in retail 12 oz cans and 500 mL bottles by the end of the month. “[Our] new blend of fresh, 100-percent fresh-pressed Northwest apples makes Brightcider refreshingly sessionable, and it also gives us the opportunity to reach out to the cider loving community and offer the first Oregon cider in cans – right in time for summer camping trips, hiking, and rafting adventures,” said David Tukush, Co-Founder and Cider Scientist. 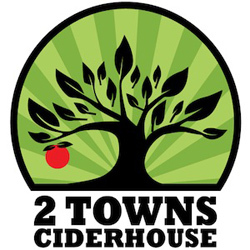 For more information about 2 Towns Ciderhouse and their “Damn Fine Cider,” visit 2TownsCiderhouse.com. 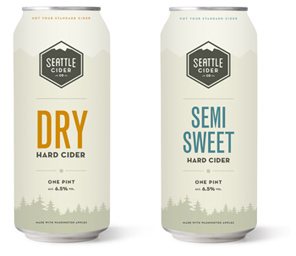 Seattle Cider Company – Seattle’s first cidery since Prohibition – unveiled plans to release a new line of craft ciders in 16-ounce cans. Bridging the gap between wine and beer with flavorful, small-batched cider, Seattle Cider’s initial offerings will include Dry and Semi-Sweet, which will break the mold of overly sweet cider, bringing the natural flavors of Washington apples to the forefront. Naturally gluten-free and made from a custom blend of fresh pressed, Washington apples, Seattle Cider’s products are handcrafted with all natural ingredients, never from concentrate. Scheduled for release in September, these unique ciders will be available in cans and on draft in select markets throughout the Pacific Northwest. Seattle Cider’s Dry is one of the driest ciders on the market, with zero-percent residual sugar (0 Brix). Featuring a 6.5% ABV, the golden orange glow of this unique unfiltered cider lends way to notes of lilac, blood orange and green apple on the nose. Dry and pleasantly acidic, flavors of nectarine, under ripe peach and tart cherry hit the palate, with no sweetness to be found. Only Washington grown apples, including Fuji, Gala, Golden Delicious, Granny Smith and Red Delicious, are used to create this unique cider. 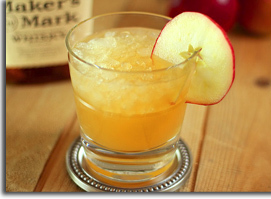 The Semi-Sweet is a light, crisp cider with just a touch of sweetness. This refreshing, honey-toned cider comes in at 6.5% ABV with an approachable 3 Brix. Notes of bergamot orange, lemon and apple give way to hints of citrus and cinnamon on the palate, allowing the true flavors of the Washington-grown apples to show through. 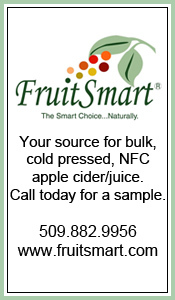 As with the Dry, the Semi-Sweet features a blend of only Washington grown apples, including Fuji, Gala, Golden Delicious, Granny Smith and Red Delicious. Seattle Cider Company is a longtime dream of Joel VandenBrink. As current owner and founder of Two Beers Brewing Co. – a rapidly growing microbrewery founded in 2 007 – VandenBrink began to see an increase in the number of people asking for gluten-free options, including two of his own employees who were recently faced with gluten allergies. With production facilities located next door to one another, the two businesses will share a common tasting room dubbed “The Woods,” making it the perfect destination for locally produced craft beer and cider. Available in 16-ounce cans beginning September 2013, Seattle Cider products will be available in select markets throughout Washington, Oregon and Idaho. Seattle Cider will also be available on tap at Seattle-area bars and restaurants with tastings, kegs and growler fills available at The Woods tasting room in SoDo (4700 Ohio Avenue, Seattle, WA 98134). For more information and updates, follow Seattle Cider Company at Facebook.com/SeattleCiderCo. After serving up Canada’s most iconic beer for more than two centuries, Molson Canadian is expanding its product line with the launch of Molson Ca nadian Cider. The launch marks the first time that the brand has offered a non-beer alternative since 1786, when John Molson officially opened the doors to the company’s first brewery. Like Molson Canadian, Molson Canadian Cider is made from the highest quality ingredients available including apples that are 100% Canadian grown. The traditional English style cider has a bold apple flavor, with a balanced medium sweetness and medium acidity that is provided by the fruit. The result is a crisp, sharp, refreshing taste that finishes incredibly smooth. Molson Canadian Cider has a 5% ABV and can be found in 473 mL cans and six packs of 341 mL bottles throughout Ontario and Nova Scotia. For more information, visit Molson Canadian Cider online at MolsonCanadian.ca.